Nanotechnology has restored the sight of blind rodents, a new study shows. Scientists mimicked the effect of a traumatic brain injury by severing the optical nerve tract in hamsters, causing the animals to lose vision. After injecting the hamsters with a solution containing nanoparticles, the nerves re-grew and sight returned. 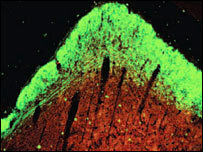 Writing in the Proceedings of the National Academy of Sciences, the team hopes this technique could be used in future reconstructive brain surgery. Repairing nerve damage in the central nervous system after injury is seen as the ultimate challenge for neuroscientists, but so far success in this field has been limited. Nerve regeneration is set back by a number of factors, including scar tissue and gaps in brain tissue caused by the damage. And this can make treatment by medical and surgical methods very difficult. To find a novel way around these problems, the team based at Massachusetts Institute of Technology (MIT), US, and Hong Kong University looked towards nanotechnology - a branch of science involving the manipulation of atoms and molecules. The researchers injected the blind hamsters at the site of their injury with a solution containing synthetically made peptides - miniscule molecules measuring just five nanometres long. Once inside the hamster's brain, the peptides spontaneously arranged into a scaffold-like criss-cross of nanofibres, which bridged the gap between the severed nerves. The scientists discovered that brain tissue in the hamsters knitted together across the molecular scaffold, while also preventing scar tissue from forming. Importantly, the newly formed brain tissue enabled the brain nerves to re-grow, restoring vision in the injured hamsters. "We made a cut, put the material in, and then we looked at the brain over different time points," explained Dr Rutledge Ellis-Behnke, a neuroscientist at MIT and lead author on the paper. "The first thing we saw was that the brain had started to heal itself in the first 24 hours. We had never seen that before - so that was very surprising." The scientists looked at young hamsters with actively growing nerve cells, and also at adults hamsters whose nerves had stopped growing. Dr Ellis-Behnke said the team was surprised to find that the nerves in the adult hamsters had re-grown after the injection. "We found that we had got functional return of vision and orientating behaviour, which was very surprising to us because we thought we would have to promote cell growth, through the growth factors." The researchers found the peptides were later broken down by the body into a harmless substance and excreted in the animals' urine three to four week after first injected. The scientists believe that they have overcome some of the barriers to nerve regeneration, and hope to be able to apply their work to medical applications at a later stage. "We are looking at this as a step process. If this can be used while operating on humans to mitigate damage during neurosurgery, that would be the first step," Dr Ellis-Behnke told the BBC News website. "Eventually what we would look at is trying to reconnect disconnected parts of the brain during stroke and trauma." Dr Ellis-Behnke said that stroke and traumatic brain injury could have a major impact on an individual. "In order to try to restore quality of life to those individuals you can try to reconnect some disconnected parts to try to give some functionality in the brain for communication and other things like that. And that's where we think that this might be very useful," he added.